1. Where did the idea for The Theseus Paradox come from? Operation Theseus was the name of a police investigation which I worked on and could never let go. The case involved the London 7/7 bombings back in 2005. It completely took over my life for five years. I felt that there were lots of things in the investigation which didn’t add up. Right from the very beginning, MI5 were adamant with me that the bombings were not perpetrated by al-Qaeda. Many aspects of the investigation pointed to a very specific reason for the attacks, yet nobody was ever directly prosecuted in the case – an outcome which I carry with me every day. My thriller uses the story of fictional character of Detective Inspector Jake Flannagan to paint a rather different picture of the possible motives behind the attacks. The paradox being – was this terrorism or was it something else entirely? 2. How do you research material for your books? I use a lot of my own background knowledge and experiences in my writing. Open source research on the internet is fantastic now too. It’s incredible the information that is available at your fingertips if you just know where to look. In many respects, I think my detective background helps me track information and answers down. I also like to talk to friends, colleagues and experts in the field – and then throw all my ideas around with my editor so she can shoot them down in flames! 3. Can you tell us about your job with the anti-terrorist branch? One day I’d be dressing up as a binman to go through the rubbish bins of a person of interest looking for clues as to what they were up to. The next I’d be analysing patterns of phone calls to see which terrorist suspects had been in contact with whom. A lot of my work was in converting intelligence into evidence. It was an exciting but sometimes frustrating time – as you will sense from my book! 4. This is your debut novel. How does it feel? Writing a book is an amazing achievement and I feel very proud of the novel that I’ve created. It’s unique in many ways because it’s a modern-day thriller but also a fact/fiction mash-up. It contains historical truths that shed new light on an old case and is grabbing the attention of respected crime journalists in the national media. I want to entertain readers and get the adrenaline and heart racing – but I also want people to look at important issues in a new light and feel like they’ve learned some real-life detective tricks along the way. One of the reasons I started writing was to tell a different version of events that existed in the investigation. I love hearing people arguing over which bits in my book really happened and questioning what they understand ‘terrorism’ to be. 5. Do you have any strange writing rituals and habits? I talk out loud a lot when I’m writing dialogue, I find this helps. Onlookers say it’s like watching me do a Punch and Judy show, where I play all the characters! I also find that I write better when I’m experiencing a depth of emotions about something. If I’m upset or angry, I can put a couple of thousand words down on paper in an hour or two – so I tend to search for some outrage about something before I start off. My editor jokes that my best work comes after I’ve had a blazing row! 6. Do you write an outline before you start off? No. I might have a premise or a theory I believe in and which I set out to prove. But just as in a real detective investigation, you should never believe you know all the answers up front. The deeper you dig, the more evidence you find – and this doesn’t always take you in the direction you expect! My work is very organic. I spend a lot of time thinking about my storylines before I start writing. I also like to research the history and politics behind things. But, often, after new evidence has come to light – what makes its way onto the final printed page isn’t always how I originally saw it in my head. 7. How long did it take to get your first book published? I’ve had the ideas for this story in my head since 2010 – when I finished working on this case. The process of actually writing it took a year, followed by six months of edits and kicking it into shape, then another six months for legal, marketing, design, proofing, and to sort out all the other parts involved. 8. What’s your least favourite part of the publishing process? Talking to agents and publishers is extremely time consuming and frustrating. Each person you talk to has a different view or idea that they want somehow incorporated into your book before they will take it to the next stage, in whatever process they are using. Some give you great advice and help shape your product into a more marketable piece, but others simply waste your time. My advice is – go with your gut feeling, it’s your book. Edgy thriller with factual twist. Reacher’s ‘I Let You Go’. Caped crusader on a rollercoaster. 11. What authors/books do you like to read in your spare time? I like to read Patricia Cornwall and Ian Rankin whilst I’m on holiday. But I must be honest and say that I’m a massive news junkie. I read everything factual that I can get my hands on. 12. What book are you reading now? I’m reading non-fiction, but I can’t tell you what because it would give away what my next novel is about! The next book is going to be even more ‘explosive’ than this one in terms of its revelations. Kindle or iBook for speed of delivery (when I need it right now!) Proper paperback for when I have the time to wallow in its pleasure, feel and smell. 14. Are you able to tell me anything about the next book? It will be a sequel starring the same main character, Detective Jake Flannagan, and it will again incorporate many ideas and theories I have behind a real-life, unsolved case. It will also involve real-life aspects and experiences from my police career. It will be bigger, better and more take your breath away than the one I’ve just written. I’m really excited about it – it’s another game-changer in the way we look at terrorism and the motives behind it. 15. During all the interviews you’ve done, what question have you not been asked, that you wish had been asked – and what’s the answer? Why didn’t you write a non-fiction, biographical account of your time working on the 7/7 investigation? Thank you David for popping by the book review cafe and taking the time to answer my questions, I shall certainly look forward to your next book, which sounds amazing. We accepted it was terrorism. But what if we were wrong? What if London’s July bombings were the greatest criminal deception of our time? 7 July 2005: in the midst of Operation Theseus, the largest terrorist investigation that the UK has ever known, Detective Inspector Jake Flannagan begins to ask difficult questions that lead to the mysterious disappearance of his girlfriend and his sudden suspension from the Metropolitan Police. Who masterminded London’s summer of terror? Why can’t Flannagan make headway in the sprawling investigation? Are the bombings the perfect ploy to mask a different plot entirely? Is Jake’s absent girlfriend really who she claims to be? While hunting for the answers to the most complex terrorist case in British history, one man will uncover the greatest criminal deception of our time. Terror, extremism and fear of the unknown, Sometimes the answer is much closer to home. I’ve been intrigued by The Theseus Paradox for a while now, I’ve read numerous reviews on social media, and all of them have rated it highly. The description of the plot sounded fascinating, but I wasn’t convinced I would enjoy this book, as much as my usual crime thrillers (sorry David). 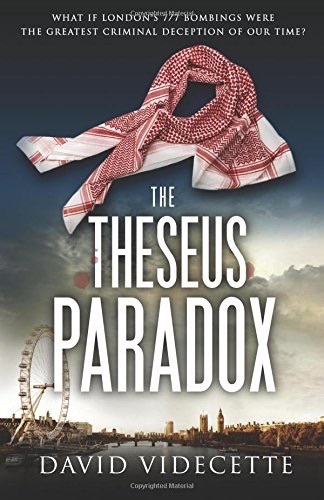 The Theseus Paradox throws new perspective on the anti-terrorist operations deployed in 7/7 bombings in London, making it a very chilling read. I find it hard to believe this is David Videcette’s debut novel, the caliber of the plot and writing is more in keeping with an author who has many books under his belt, it really is that good! David Videcette has managed to very successfully weave both elements of fiction and fact into a chilling, and very credible tale. From the first page the pace is set, as Detective Jake Flannagan chases terrorist across Yorkshire you know you are in for a hell of a ride. The chapters are fairly short, and each one starts with the time frame, which sets the pace and adds to the tension. David deals with the 7/7 events with sensitivity, he hasn’t used the events to sensationalise the plot, he uses them to build the foundations for an extremely well written and very believable tale. Detective Jake Flannagan is a very interesting character his methods are often unconventional and sometimes illegal, his superiors call him a maverick, which I think sums up his persona perfectly, he’s far from perfect he drinks to much, he’s left his wife and daughters, he sleeps around, personally I think these “far from Perfect” traits make him a very credible and likeable character. As the investigation intensify’s and the pressure begins to mount Jake’s life threatens to spiral out of control, he goes from being a gifted Detective on the anti-terrorist branch to an officer suspended from his job. As the Theseus Paradox reaches a nail biting climax, I was left questioning every thing I knew about the 7/7 bombings. What I found fascinating about The Theseus Pardox is, that although it isn’t my usual type of book,I found it to be a compelling read. 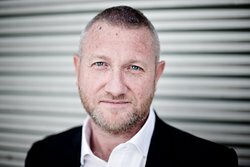 David Videcette is a uniquely gifted story-teller, who draw’s the reader in by writing a chillingly and credible tale based on real circumstances, it’s so well written it’s difficult to distinguish fact from fiction. In fact I would say The Theseus Paradox is one of my top reads for 2015, it was unputdownable and kept me reading late into the night. I shall certainly look forward to reading David Videcette’s next offering. Sales of The Theseus Paradox will support the charitable work of the Police Dependants’ Trust in helping police officers with their mental wellbeing after a major incident such as a terrorist attack or plane crash. This entry was posted in David Videcette and tagged Author Interviews, Crime Thriller, Mystery, Suspense on December 28, 2015 by lollyrugs. Love your review of The Theseus Paradox, Lorraine. Fantastic stuff! It was an absolute pleasure to be interviewed by you. Thank you also for mentioning that we are supporting the important charity work of the Police Dependants’ Trust. Very kind of you. Agree with your comments 100%, a superb book. Am also singing its praises on my blog and it will without doubt have a place in my 2016 Top Ten.